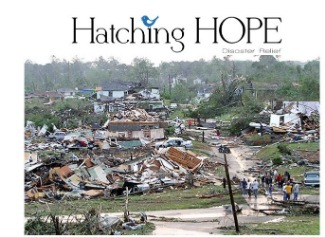 Hatching Hope will be serving in Lee County, Alabama to assist victims displaced from the horrific tornado that ripped through Lee County, Alabama on the afternoon of March 3rd, 2019. As of 10am 3/4/19, 23 lives have been lost, including two small children. In addition to our disaster relief outreach, we will provide much needed love and support for these families and will focus heavily on humanitarian aid for children, pets, and seniors. Please visit our site hatchinghopecares.org or find us on Facebook: Hatching Hope to see our latest relief work. Volunteers Needed for Friday 3/8/19 & Saturday 3/9/19. The entire team from The Onyx at 600 will be happy to volunteer Saturday. Would like to volunteer on Friday, 3/8/19, if possible. Love Hatching Hope â?¤ Will help whenever possible!!! My Son Jordan as well. Hatching Hope helping give support and second chances. I am available. Please add me to your team.